Propaganda regarding foreign powers and its assumptions with stereotypical criminal behaviours is a result of prejudice. This paper will discuss the eighth issue of Active Comics (1942), focusing on illegal drugs in conjunction with propaganda in Canada during World War II. In Active Comics No. 8, the stories have caricatures of stereotypical Indigenous and Japanese people, in relation to drugs and other criminal behaviours. The racist undertones in comics during World War II regarding cultures untypical to “white-European” Canadians and involving the issue of drugs (specifically cannabis and opium) should be addressed. The first story in the issue, “The Dixon of the Mounted,” is about a criminal investigation surrounding the illegal distribution and abuse of cannabis. As well, “Captain Red Thornton,” features Japanese caricatures in association with other forms of crime. In addition to the topic of crime, on page 16, there is a “funny page” glorifying a criminal activity. To contrast, the regular displays of prejudice, one of the stories, “ The Misadventures of Mild Will,” is the opposite of the other stereotypical stories. The story has Indigenous caricatures that could be deemed rational, are not inflicting violence, and are victims of senseless violence. The placement of this comic is used for ironic comedy. This comedy uses the opposite of what is stereotypically done in order to create humor. In Active Comics No. 8, possessing illegal drugs and criminal activities, such as murder and arson, is in clear affiliation with figures of Japanese and Indigenous backgrounds. This reveals the writer’s intentions of propaganda and wartime subliminal messages. The purposeful connections insinuate that the reason for criminal activity is the characters being from foreign powers, giving the readers a preconceived political wartime stance. The objective of this research paper is to determine why these propagandistic messages were placed in children’s comics during World War II. Ultimately, the the writers’ tactics enforce the idea that drugs and foreigners were bad in a collective manner. “Dixon of the Mounted” by Ted Steel, reveals the highest level of stereotyping and criminalizing “foreign” peoples. In this comic, the Dixon travels to a lifeless and grim snowy landscape to find an Indigenous criminal. The illustrated Indigenous caricature that wears exaggerated traditional native clothing is being sought out because he smokes and sells marijuana – “marihuana” as its called in the story. The aboriginal man also commits other crimes due to the consumption of the drug, such as setting the cabin on fire in hopes of murdering the Dixon before being caught. Henceforth, visualization of the correspondence of marijuana with a man of a foreign background was displayed to children. The story, “Dixon of the Mounted,” are collectively meant to scare children into not smoking marijuana, due to the irrational and criminal behaviour it creates. Additionally, the comic persuades the reader to believe that Indigenous people are the influencers and the primary sources of this substance abuse. Japanese and Aboriginal cultures faced much oppression during their years in Canada following World War II. Japanese immigration was brought into Canada for cheap labour, which caused opium distribution to arise as a societal issue (Boyd 26). The belief that Japanese people are the reason for drug distribution could be routed to the historical event of The Opium war between China and the British Empire (839 – 1860.) Therefore, the assumption that opium is connected to Japanese people will be derived from this historical event. Also, Canada in the 19th (and continuing shortly into the 20th century) is known to have made a negative impact on Indigenous people due to the conditions and difficult circumstances they were put through. More specifically, during the years before World War II (roughly 1934-1943), Indigenous people in Canada were put under much supervision and isolation. This can be noted from viewing a 1936 news article titled “Canada’s Indians”. The article title itself reveals the possessive approach that Canada’s government took towards Indigenous cultures; they were under “general supervision,” were “minors under the law,” and additionally, a government department called Department of Indian Affairs existed (48). Found in the National Museum of Canada, the archival book Canada’s Indian Problem, by Janness Diamond, states that “. . . to encourage any merging of the protected races with their protectors, because white people, particularly those of Anglo-Saxon . . . have strong prejudices against intermarriage with coloured peoples. (Japan, we may notice in passing, likewise discourages the intermarriage of her nationals with the Ainu)” (Diamond 379). When Active Comics No. 8 displays these cultures in a manipulative way, it caused these prejudices to influence the reader and allow the future generation of adults to have the same destructive beliefs. The legalization of marijuana in Canada took years of persuasion and debates. It has come to reality with multiple precautions and procedures in 2018. Opinions and debates dated back to the early 19th century reveal Canada’s foundation of formulating the new legalization. From this, misconceptions of drug association may arise due to miscommunication brought from fear of an unknown substance; much like the fear of unknown and foreign cultures to Canada. One misconception in Active Comics No. 8 is that criminal behaviour arises from smoking marijuana. Nonetheless, that belief has been statistically proven to be false in the sociological article Cannabis and Crime: Findings From a Longitudinal Study by Willy Pedersen. He proves that the use of cannabis does not lead to any continued action of criminal behaviour. Conversely, the use of cannabis-related crimes is highly apparent (Pedersen 116). It is also apparent that there is not much research surrounding the use of cannabis and non-cannabis related crimes. This implies that avoiding this research was done purposely so that it is automatically assumed that smoking marijuana was the leading cause of all crimes and not just marijuana-related offenses. The collection of the comics, also known as The Canadian Whites, represented the effects of marijuana as the causes of the comic book characters criminal commitments. To feature this, falsehoods and false evidence are presented multiple times through; action-packed, war hero and comedic stories. Active Comics has done this to display to a young audience that drugs, crime, and foreign powers, collectively and separately, are things to be afraid of. A newspaper article, “Dope Stimulation and Hot Jazz,” written in 1943 by J.V McAree, said that “Crooks of various kinds are fond of [marijuana]” (McAree 8). Also, the 1948 National Film Board documentary Drug Addict follows an inmate in jail who becomes interested in drugs. These past World War II mediums purposely highlighted criminals with marijuana and always correlate them with each other. In order for the Canadian Whites to display this as well, it is evident that extreme literary misrepresentations have to be used to stronger convey the same message. Figure 1 displays two Japanese men running from Canadians. The description to the image is: “This is a poster we had when entertaining some Canadian boys. Maple leaf is a little bit of ‘home’ you kindly sent me” (Canadian War Museum). 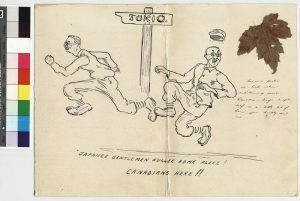 The description reveals how a source of entertainment for “Canadian boys” was another representation of Japanese caricatures being stereotypically manipulated. Figure 1 is also manipulated to sound like a Japanese accent, which further adds to the racism. The same racist illustration is also visible in the story “The Misadventures of Mild Will.” The comic manipulates the dialogue to make the caricatures emphasize their accents which insinuate their lack of intelligence. An example of the same verbiage in the comic is, “[w]hat’sa idear, buttin’in? Ah’, supposed to be the hero in this hyar comic strip!” (Steel 31). Along with in “Captain Red Thorton,” by Al Cooper, the Japanese enemies are illustrated much like in the war artifact; they both have farfetched stereotypical features (Cooper 49). The illustrations and verbiage are placed to create humor for the intended audience. In the war adventure story, “Captain Red Thorton,” the “predators”, or antagonists, are Japanese characters against ”white-European” characters. An interesting illustration from this story on the front cover of the comic is a close-up shot of a Japanese “predator.” The Japanese caricatures expression is angry; which is evident from the exaggerated lines along his face to make him seem more aggressive. The article “This is Our Enemy” by Paul Hirsch focuses on the comic titled All Star Comics. Hirsch talks about how the demographic and perception of the comics were race-themed mediums that were cheap sources of entertainment. Also, the article goes into detail about how choosing the medium as a source of portraying propaganda stereotypes is a universal and complex method. All Stars Comics is American, and the article was published in California. By looking at this American artifact in comparison to the Canadian comic, it is interesting to note the similarities between them. They both portray representations of the race to persuade a person to think intended messages of government manipulated messages. The reasons for North American tactics in communicating propaganda messages to children are apparent. Adults during this period would most likely be aware of the political news happening around the world and the implications of this to their home country. Children, on the other hand, would not know as much. By hinting at these political views from the country they currently reside in, they can educate the children on what to believe through comics (although it may be factual or not). The 1940s messages of propaganda are displayed in many multimedia forms. The article “Anglo-American Anti-fascist Film Propaganda in a Time of Neutrality” explains Charlie Chaplin’s film, The Great Dictator, to be an example of a manipulation of media to display wartime messages. The article also goes into to detail about what makes a propaganda film (“predator vs. prey,” “hero vs. villain”) create “mass persuasion” (Cole). Messages of drug use are also apparent in children’s motion pictures. 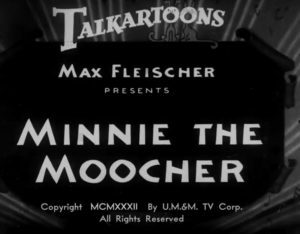 In Max Fleischer’s, Minnie the Moocher, the animated characters undergo a chaotic-dreamlike scenario in which inanimate objects come to life and appear as a sort of hallucination. That movie experience creates a correlation with the sensation one may get from being under the influence drugs (fig. 2). After studying both of these motion pictures, one can understand why Active Comics would use a children’s medium to incorporate drugs and wartime messages as a tactic. Although this comic was on a smaller scale of popularity then these Hollywood entertainments, it still portrays the exact techniques to emphasize the message trying to be installed into youth’s minds. 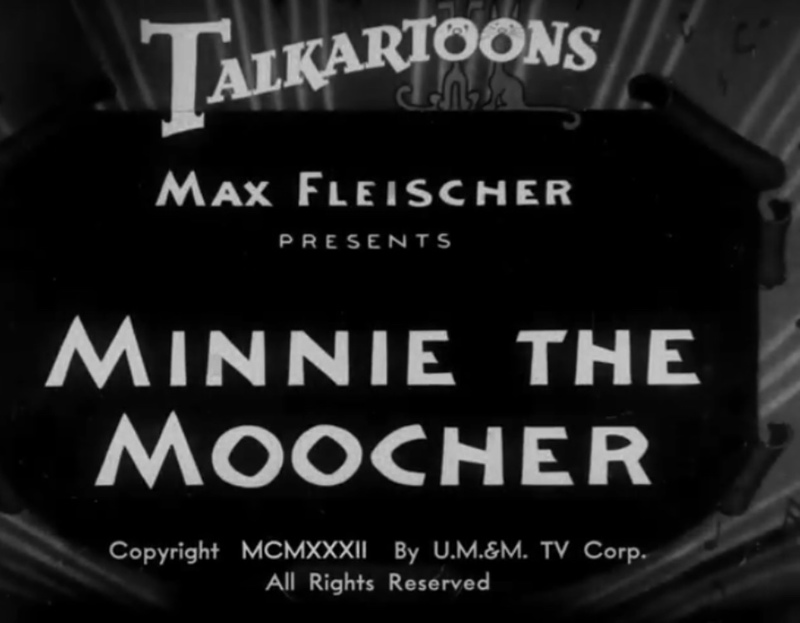 Minnie the Moocher displays Hollywood’s creation of the fascination of substance use in a way that is appealing to children (by using cartoons, comedy, and catchy music). The same question of why Max Fleischer decided to create Minnie the Moocher is similar to the question of why The Canadian Whites created certain stories in Active Comics. Both children targeting mediums display content that seems to be confidential to children, giving much insight into the creator’s intentions of the audience. The government’s way of trying to communicate with the youth of WWII is proven to be useful in current studies. This is because using comic books helps children explore their creativity, be entranced in the comic book character’s adventures, and stimulate visual senses according to the article, “The Native Comic Book Project: Native Youth Making Comics and Healthy Decisions“. This article discusses the positive impact that comic books have on Indigenous children who may suffer consequences of substance abuse or other mentally harming encounters. After examining all of Active Comics No. 8 and cross-referencing adult mediums of WWII (newspapers, films, articles) to the content found in the comic, Canadian government intentions become clear. By collectively showing drugs, negative displays of foreign figures and actions of hate in crime fighting and adventure stores, a child may be manipulated to believe that all of these fabrications are believable. From this, that child may now be more heavily interested and inclined to participate in wartime activities, whether it be by becoming physically involved in the war or sharing the message that war is good. Youth become more involved and informed stance in political behaviours. Active Comics displayed content to children that were intended to create humor and action while simultaneously warning them of crimes by manipulating Canada’s oppressed races, and ergo, creating both motive and bias in children’s effort in the war. “Cartoon Drawing, Japanese Gentlemen Hullee Home Pleez! Canadians Here!!! ” Canadian War Museum, 1939-1945. www.warmuseum.ca/collections/artifact/1361339/?q=cartoon drawing&page_num=1&item_num=17&media_irn=3141295. Cole, Robert. “Anglo-American Anti-Fascist Film Propaganda in a Time of Neutrality: The Great Dictator, 1940.” Historical Journal of Film, Radio and Television 21, no. 2, June 2001, pp. 137–52. https://doi.org/10.1080/014396801200 51488 . Hirsch, Paul. “‘This Is Our Enemy’: The Writers 2019; War Board and Representations of Race in Comic Books, 1945.” Pacific Historical Review 83, no. 3, 2014, pp. 448–86. Legault, E.T. (w) and M. Karn (a). “Dixon of the Mountain.” Active Comics , no. 8, March 1942, pp. 1-9. Canadian Whites Comic Book Collection, 1941-1946. RULA Archives and Special Collections, Ryerson University, Toronto, Canada. Legault, E.T. (w) and M. Karn (a). “The Misadventures of Mild Will.” Active Comics , no. 8, March, 1942, pp. 1-9. Canadian Whites Comic Book Collection, 1941-1946. RULA Archives and Special Collections, Ryerson University, Toronto, Canada. Montgomery, Michelle, Brenda Manuelito, Carrie Nass, Tami Chock, and Dedra Buchwald. “The Native Comic Book Project: Native Youth Making Comics and Health Decisions.” Journal of Cancer Education 27, 2012, pp. 41–46. https://doi.org/10.1007/s13187-012-0311-x . Pedersen, Willy, and TorbjÃ ̧rn Skardhamar. “Cannabis and Crime: Findings from a LongitudinalStudy: Cannabis and Crime.” Addiction 105, 2010 pp. 109–18.https://doi.org/10.1111/j.1360-0443.2009.02719.x . Writer, Linton Burkett Post Staff. “Marihuana Dangerous, Agents Say: Drug Loses Urge Leading to Crime; Results Worse Than Opium Derivatives.” The Washington Post (1923-1954); Washington, D.C. July 13, 1943.